Chubby Marines and lax commanders beware. The commandant of the Marine Corps has you in his sights. 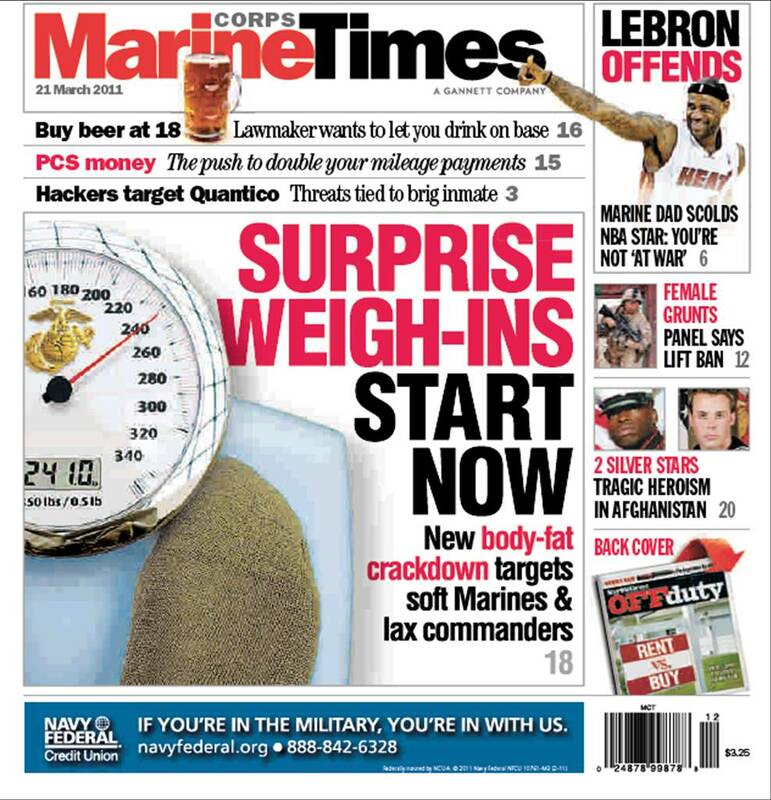 This week’s Marine Corps Times cover story is about the commandant’s plan to crack down on lax enforcement of body composition standards with surprise weigh ins to be conducted by the Marine Corps Investigator General this summer. Any Marine outside of standards should be in the Marine Corps’ Body Composition Program or Military Appearance Program the commandant has said, but it doesn’t look like that is always the case. While touring the fleet with Sergeant Major of the Marine Corps Carlton Kent, he’s seen too many who don’t fit the image of a squared away Marine. The IGs investigation this summer should reveal just how many out-of-regulation Marines aren’t in one of the remedial programs. The Marine Corps may be the most fit of the services, but there are still plenty of Marines on the heavy side with thousands enrolled in the BCP program every year. Officials emphasized that there are no changes to regulations in the works. But, the IG said it is possible the commandant could reconsider standards and their enforcement based on the findings of their report. Read about what to expect in this week’s Marine Corps Times on newsstands now. Or, subscribe here. A Marine is a Marine. Regardless of race,creed,color or ethnic back ground. And all and I do mean all from the top guy incharge down to lonely priviate. Remember you chose to come work for us and we have standerds for all and if your not willing to stay with in them then it’s time to say see you. I agree with that jarhead71. You are a motivator. And when it changes a few years from now to a different standard, you or a guy just like you will be standing on the podium yelling at Marines to get within this standard or get out. In the meantime, someone with education and some brains will one day influence a better way to measure fitness for you to stand out there and yell about on the podium. You are doing great. Promote jarhead71 now. He probably can’t even spell MOS.